John Everson will be the guest in The Writer’s Chatroom on Wednesday, October 25, 2006 at 9 p.m. Central. Stop in and talk about horror for awhile! The password for the chat is darkarts. Breedlove & Everson to appear on B&N Horror/Thriller Author Panel! 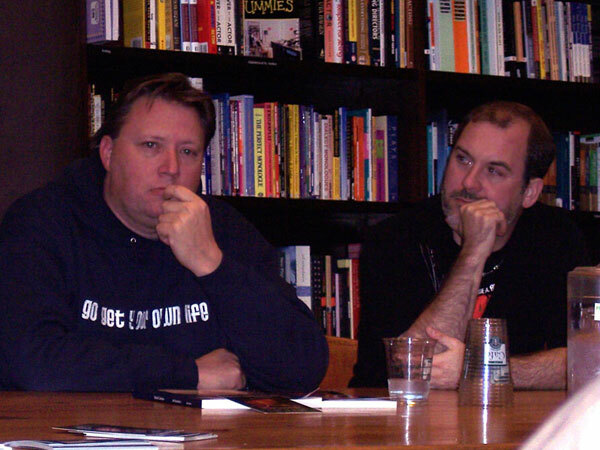 Bill Breedlove and John Everson consider their responses carefully while on a bookstore author panel in Wisconsin. Bill Breedlove and John Everson were part of a horror/thriller author panel at the Wauwatosa, WI Barnes & Noble on Oct. 20, along with five other authors.